On May 10, 2014 a great team of Emory staff, physicians and friends came together to help fight breast cancer in our community. 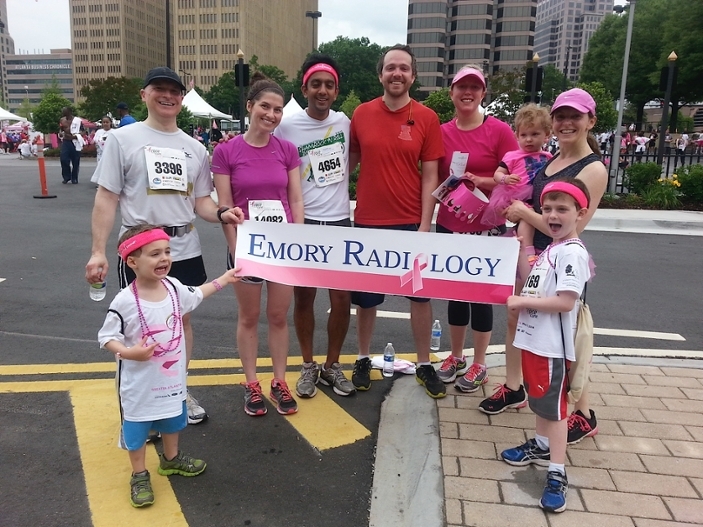 In just 2 1/2 weeks, Team Emory Radiolgy raised over $1000 for the Komen Atlanta Race for the Cure. Teammates walked or ran a 5K starting at Lenox Square, and their little ones participated in a 1 mile Kids for the Cure race. Everyone had a fantastic time supporting the fight against breast cancer! The Komen Race for the Cure is a community event that honors and memorializes breast cancer survivors, co-survivors and those that have lost their battle to the disease. The Race also plays a vital role in raising funds for research, education, prevention, advocacy and treatment. Each year over 1.7 million people take part in Race for the Cure events around the world.